As of July 17th, 2004 he has earned 6 points from the puppy class. Quincy comes from the exclusive House of Whisperwind. Whisperwind Standards are known for their beauty and quality. Ch. Whisperwind on a Carousel aka Peter won 101 Best in Shows including the Garden before retiring. Whisperwind dogs can be found on all White and Silver top winning dogs in the country and the World. Friend and Breeder Linda Blackie has entrusted us with this magnificent silver boy for us to show and care for. He excels in attitude, personality, disposition and movement. As of June 24th he has earned 13 points including a Major!! 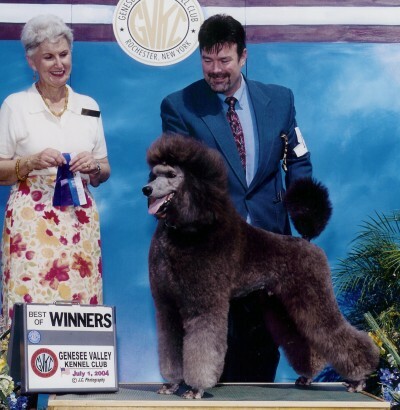 Quincy was awarded his second major on Nov 4 at the Bald Eagle KC Shows in Bloomsburg, PA. He, together with Antonio, finished their championship that weekend. It was exciting to say the least!!!! !